Stephen Curry Introduces Newborn Daughter Ryan: First Photo! His favorite girls! NBA star Stephen Curry officially introduced his newborn daughter, Ryan, via Instagram on Tuesday, July 14. "I&apos;m wayyyyy up I feel Blessed! God is Great," the Golden State Warriors point guard, 27, captioned the pic. "Thanks to the doctors and staff at Alta Bates for taking care of my girls, especially Dr. Poddatori." He added: "Healthy baby and @ayeshacurry is all I prayed for. #prouddaddy." 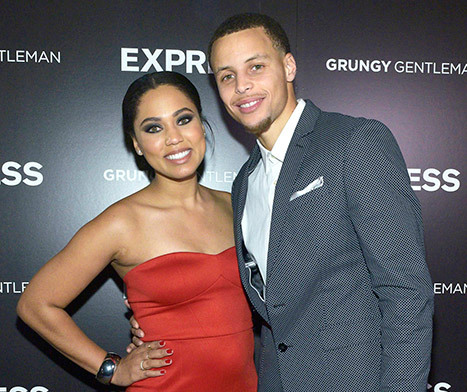 Curry and his wife, Ayesha, welcomed their second child on Friday, July 10. In the adorable snapshot, the couple&apos;s spunky 2-year-old daughter, Riley, holds her little sister while sitting on her mom&apos;s hospital bed. "God is amazing. The gift of life is truly an indescribable thing," Ayesha wrote on her personal blog on July 12. "Stephen, Riley and I are enjoying this gorgeous gift from God and basking in the present! We are now officially a family of 4! Riley is completely enamored with her little sister and has taken on her role as big sister beautifully. I am already so proud of her!"